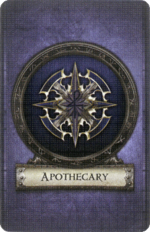 Apothecary is one of the class options for the archetype Healer. This class was first introduced in the Labyrinth of Ruin expansion. It utilizes a unique mechanic involving the use of Elixir tokens. The Apothecary is a walking treasure-trove of elixirs, tonics, and other concoctions. It would be foolish, however, to assume that the Apothecary is a mere peddler of potions; many a foe has made that mistake, only to find themselves choked with poison gas. Its starting equipment is the Smoking Vials, and the skill Brew Elixir. Brew Elixir 0 Exhaust this card during your turn. Choose yourself or an adjacent hero to gain 1 elixir token. Inky Substance 1 Exhaust this card to choose 1 monster within 3 spaces of you and place an elixir token on it. Protective Tonic 2 Exhaust this card immediately after a hero discards an elixir token to place 1 of his hero tokens on this card. Secret Formula 2 You gain +2 Health, even while this card is exhausted. Potent Remedies 3 When a hero discards an elixir token from his Hero sheet, he may roll 1 additional green power die and recover equal to the rolled, in addition to any recovered (even if this card is exhausted). Apothecary starting skill Brew Elixir. Apothecary starting weapon Smoking Vials. This page was last modified on 8 November 2018, at 15:04.